I have not been particularly talkative lately, I know, nor have I been sewing. With the stress at work combined with the stress of planning the move to North Dakota, I have found it easier to turn to knitting for relaxation and quiet time. I’ve had fun rediscovering the joys of hand-knitting. 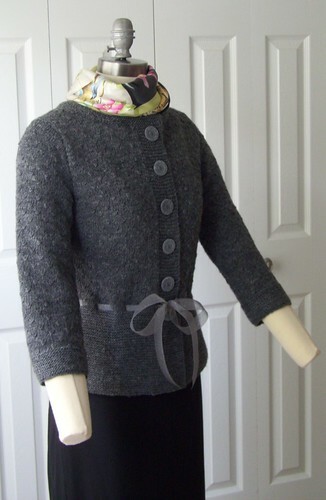 My latest project is the Bea cardigan by Kim Hargreaves. I can’t wear it here in Florida yet because it’s still too hot for it but it will be perfect for my trip to Minot next week. I’ve cast on. I’m not a fan of seaming, so I cast on the fronts and back together in one piece. That’s a lot of stitches on fairly small needles. I have knitted 42 rows of the garter stitch peplum – easy knitting so far. I also read through the whole pattern and did some calculations to figure out where the buttonholes will be, before I get far enough to make the first one. In this pattern, the buttonhole borders are knitted in one piece with the fronts (my preferred way). I am loving the textured pattern! So subtle and intriguing, in a how-did-you-that way. And it keeps the cardigan from becoming a death-by-stockinette project. I finished knitting the body of the cardigan. It’s drying on the blocking board now. I kitchener-stitched the shoulders, wove in the yarn ends, and finished the neckline. Tried it on (at least 17 times). Not sure the neckline shape is very flattering on me but with a scarf it won’t be an issue. I might make the front neckline deeper on the next one. It is finished! I sewed on the buttons and steamed the shoulder seams so it will be ready for pictures tomorrow. I used a store-bought ribbon for the waist tie – I really wanted a nice velvet one but with Jo-Ann’s being the only game in town, the glitter ribbon will have to do until I find what I want. I bought three different sets of buttons because I just couldn’t decide. After hours of deliberation, I decided to use the matte gray ones – they’re actually made of recycled cotton fibers (up to 80%), which is pretty cool. The label says they’re washable. I backed them with small flat buttons for stability. All in all, a fun easy knit. I love the fitted shape. And it is definitely warm. 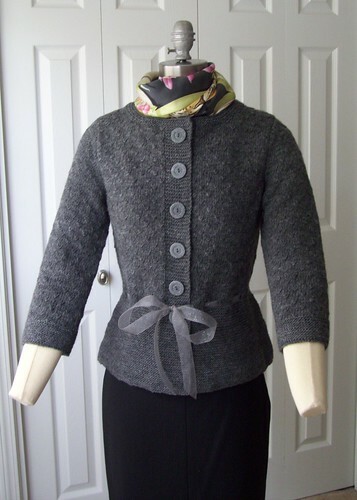 Both the wrap and the cardigan are beautiful! Well at least North Dakota was your choice but how long have you been in FL? It seems like you just got there and now you’re moving again! I’m not a big home knitting fan, but when I see garment as tasteful and stylish as this I wish I could knit. My left handed mother was unable to teach me. Beautiful sweater! Almost seems to classy for ND! Just kidding! I went to college in Moorhead, MN, just across the river from Fargo. Lot’s of classmates were from the ND – the sunflowers are amazing when the weather does warm up! Good luck with the move. I already admired this on Ravelry, but let me say it again : this is truly stunning, Alexandra! You are a very talented knitter. This is just gorgeous! I saw it in the thumbnail under your recent post. I knit, but so far haven’t been brave enough to try a sweater. I love the way this one is fitted and so sleek looking. Are you still wearing it?